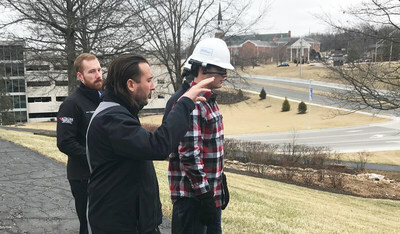 KANSAS CITY, Mo., April 10, 2019 /PRNewswire/ -- Burns & McDonnell has joined with Manitoba Hydro International Ltd. (MHI) to implement its VisualSpection™ platform, an augmented reality software for wearable devices. 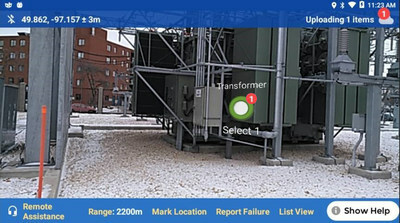 Utilities and field professionals rely on VisualSpection for enhanced, safe inspections of a variety of complex technical systems required for transmission, distribution, generation and operation of power facilities. Under an agreement with MHI, Burns & McDonnell is the exclusive AE firm providing VisualSpection throughout the U.S. and Canada. VisualSpection is built for smart-glasses devices or heads-up displays (HUDs) that are typically mounted on the user’s hard hat. The VisualSpection platform, coupled with Heads Up Displays, seamlessly observes, collects and organizes site-specific information from any system, including substations, distribution lines, transmission lines or power plants. VisualSpection is built for smart-glasses devices or heads-up displays (HUDs) that are typically mounted on the user's hard hat. The VisualSpection platform, coupled with HUDs, seamlessly observes, collects and organizes site-specific information from any system, including substations, distribution lines, transmission lines or power plants. VisualSpection provides field employees with a hands-free experience and the ability to follow clear workflows for inspections or any site-related activities using augmented reality (AR). In addition, VisualSpection offers live peer-to-peer connection between site personnel and others in the office, allowing for quick and effective resolution of site questions or issues. "There are many benefits to utility users of VisualSpection, but we believe safety and cost savings will certainly rise to the top of the list," says Jim Hogan, senior vice president with the Burns & McDonnell Transmission & Distribution Group. "The data available will eliminate the need for many physical inspections of equipment in substations, transmission and distribution lines and other facilities. Utility field crews will have key data that allows early detection of problems so they can be fixed before they result in equipment failure." "Being part of a utility, we understand the pain points that the entire industry encounters and are committed to providing innovative solutions to meet our client's evolving needs and challenges," says David Enns, managing director with MHI. "We are proud to partner with Burns & McDonnell on this significant initiative — providing a seamless and practical method of retrieving big data and turning it into an easy-to-understand format with clear solutions." MHI provides innovative solutions to help customers in the energy and telecommunications sectors. We are a subsidiary of one of Canada's most highly regarded energy utilities, Manitoba Hydro. As a strong and diversified centre of innovation, MHI operates right across the electricity market — from generation, through transmission and distribution, to the end user. For over 30 years, we have provided leading-edge services and products to our clients in over 120 countries around the world. For more information, visit mhi.ca.